The political sea change represented by the orange wave in 2011 seems about to wash ashore the first labour-linked federal government in Canadian history. The union-based New Democratic Party led opinion polls in early September, and is poised to form a majority in Parliament after the October 19 vote. While pundits debate whether this political tsunami is due to mass disaffection with the authoritarian Conservative regime under Stephen Harper more than popular infatuation with the NDP’s milquetoast election platform, undeniable is the fact that the two-party system that dominated Canada for a century and a half is a thing of the past. To say that this makes the Canadian establishment nervous is an understatement. The ruling rich would much rather limit the ‘practical’ choice of voters to the Bay Street-backed Liberals and Tories. In fact, Capital is so rattled by the polls that a section of big business has pushed the Liberal Party under Justin Trudeau to campaign ostensibly to the left of the NDP. To create jobs and stimulate the recession-bogged economy, Trudeau pledges to spend billions to repair infrastructure and to reduce taxes on the “middle class”. He forecasts three years of federal budget deficits. NDP Leader Tom Mulcair stubbornly insists that he will not even contemplate a deficit budget, prompting Trudeau to predict that Mulcair would be forced to renege on bold multi-billion dollar spending plans, ranging from childcare to health care. Clearly, the Liberals are guilty of supreme chutzpah. It was former Liberal Finance Minister and Prime Minister Paul Martin (now campaigning alongside Trudeau) who imposed the biggest cuts in federal spending in Canadian history. 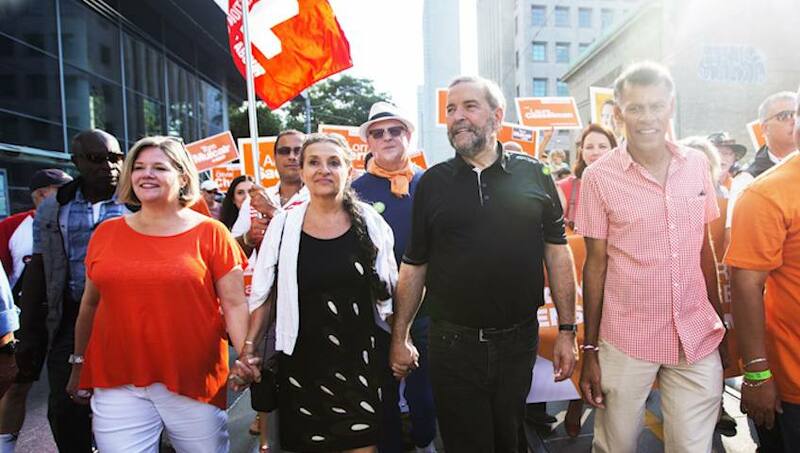 Still, Tom Mulcair has a serious problem. Without substantially increasing taxes on giant corporations and the affluent, which runs counter to his mantra of holding the line on personal income tax, providing tax credits for businesses that invest in innovation, and his proposal to reduce the small business tax rate from 11 to 9 per cent, Mulcair is cutting himself off at the knees. Bay Street, would likely trim or postpone indefinitely its promised reforms, thus alienating its popular base. 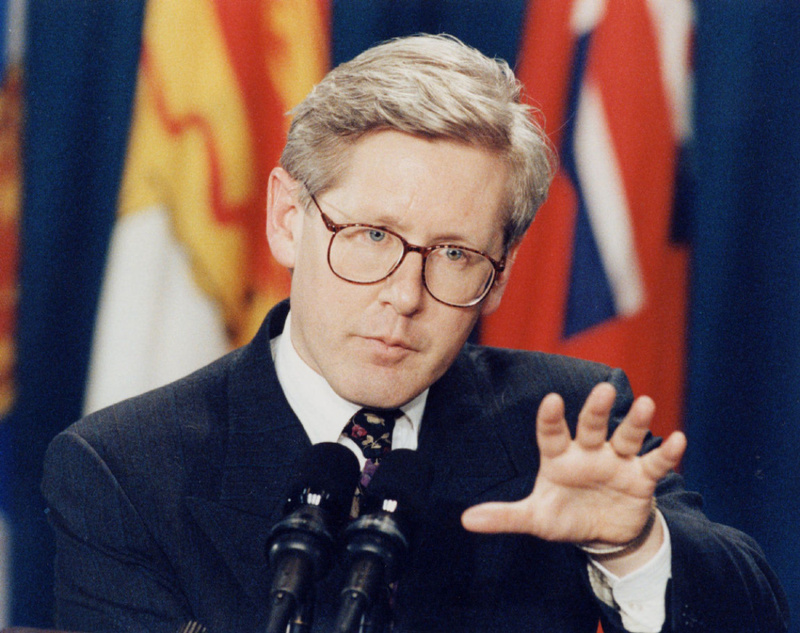 Likely is a re-play of the Bob Rae Ontario NDP regime of the early 1990s which not only abandoned its promise of public auto insurance, but slashed spending, contracted-out services, and imposed unpaid ‘holidays’ on public employees. Mulcair’s effort to shake the spendthrift image of the NDP, unjustly fostered by the corporate media, by aping the fiscal conservatism of the Tories, follows in the shaky footsteps of Ontario NDP Leader Andrea Horwath. She apologized to the party faithful for a disastrous June 2014 provincial election campaign. Mulcair, in the short run, may get away with it because the Harper Conservatives are forced to wear the current economic downturn. They look like dictators and warmongers, and are up to their eyeballs in deceit over the Mike Duffy, et al, Senate spending scandal. Nonetheless, over time, Mulcair will have to square his social promises with his tax policies. He will have to deal with his contradictions on pipeline construction, international ‘free trade’ deals, support for police and the military, and his persistent excuses for the atrocities committed daily by the Israeli apartheid state and its merciless seige of Gaza. 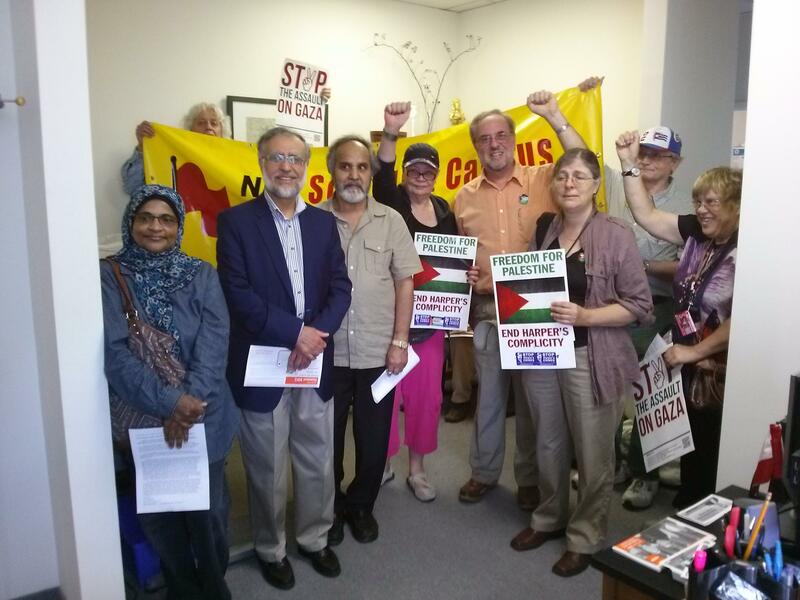 Members of NDP Socialist Caucus deliver message to NDP MP Craig Scott (Toronto-Danforth) constituency office, August 2014. 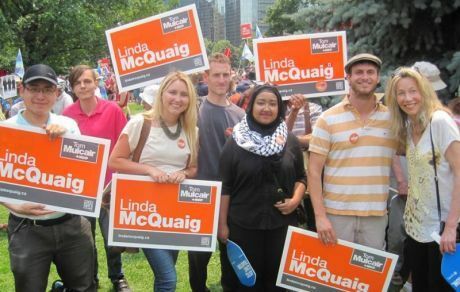 In Toronto Centre, the party brass silenced star candidate Linda McQuaig for publicly stating the obvious, that much of the Alberta oil should be kept in the ground if Canada is to meet its commitment to reduce green house gas emissions. These positions are problematic for the NDP leadership, particularly in Quebec, where such issues strongly resonate and the party enjoys a commanding lead in the polls over the Liberals, the Conservatives, the Greens, and the nationalist Bloc Quebecois. The BQ is tainted by its association with anti-worker laws enacted by its provincial cousin, the Parti Quebecois, in recent decades. That should not be confused with an absence of support for Quebec sovereignty. The staunchly federalist Mulcair will still have to ride the tiger of Quebec’s national aspirations, given that up to half of his MPs will likely hail from that nation/province, drawing much support from ex-BQ voters. This is the longest election campaign in modern Canadian history (a tactic the autocrat Harper may already regret). Much can still happen to change its course. The point, however, is not simply to interpret the train of events, but to influence it. An NDP victory will open the space for leftist ideas. It will likely secure and restore home mail delivery, un-muzzle scientists working for federal departments, eliminate some of the egregious tax breaks for the rich, lift the lid on the murder and disappearance of thousands of aboriginal women, raise the minimum wage, and possibly establish quality, public child care for up to a million kids. Those who advocate national Pharmacare, and public ownership of Big Oil and Gas to facilitate a major shift to green energy systems, will gain a much wider hearing as a result of an NDP win. Those who promote steeply progressive taxation of big business and the rich to reduce glaring inequality and to meet human needs, those who want a foreign policy based on solidarity with the oppressed and firm opposition to war and imperialism, those who demand an end to state spying on everyone, and a halt to repression of social justice seekers, will feel the wind at their backs. progressive pledges. They will step on the toes of leaders of labour affiliates. They will disavow social protest movements. Their commitment is to capitalism with a human face. It is hard to imagine a more monumental contradiction-in-terms, even at the best of times. Today the world economy is in recession, with waves of desperate refugees fleeing the ravages of imperialist intervention and environmental disasters induced by the heartless private profit system. If the betrayal of Syriza, a supposedly radical leftist party in Greece, was predictable, the retrenchment of an NDP regime in Ottawa is almost a foregone conclusion. And an NDP coalition with the Liberal Party, or even with the Green Party, would only furnish more excuses for retreat from a progressive platform, let alone rule out a Workers’ Agenda – so the notion of an NDP alliance with any capitalist party should be rejected in principle. The merit of fighting for an NDP government is not diminished by the pro-capitalist outlook of its leaders because the prospects for socialism depend on the class struggle, not on the low political horizons and the narrow career ambitions of party officials. For the class struggle to advance the interests of the vast majority, partisans of the working class should be organized to fight for socialist measures. That effort must take place both inside and outside the party and its labour affiliates. An NDP victory will raise the confidence of working people to assert their demands. It will alter the relationship of class forces to the disadvantage of Capital and in favour of the popular majority. In the remaining weeks of the campaign, socialists will seize the opportunity to canvass their neighbours in support of local NDP candidates, collect signatures on the 4Ps petition being circulated by the NDP Socialist Caucus (see below), and urge people to Vote NDP, without illusions. We, the undersigned, applaud Federal NDP Leader Tom Mulcair for advocating a national childcare plan, a $15/hour minimum wage, and for opposing repressive Bill C-51 and the extension of the bombing of Iraq, and into Syria. Pharmacare – a national drug plan will save Canadians over $7 billion, and is urgently needed to improve public health, especially of seniors and the poor. Pipelines – the big drop in the price of oil presents a golden opportunity to oppose pipeline construction, to re-tool, and to go for green energy conversion (wind, hydro, solar, geothermal and biomass). To fund that gigantic energy shift it will be necessary to conscript the enormous accumulated wealth of the resource corporations by nationalizing Big Oil and Gas under workers’ and community democratic control, while respecting Indigenous peoples’ rights. Progressive Taxation – it will cost much money to provide $15/day childcare and other vital social expenditures required. The federal NDP should insist, not only on plugging tax loopholes, but on steeply taxing big business, the banks and the super-rich, while phasing out the regressive HST. Palestine – over 2,000 residents of Gaza were slaughered by Israeli forces last summer. Benjamin Netanyahu and his racist Likhud coalition were re-elected after promising there will never be a Palestinian state. The two-state solution is dead. The alternative is a one-person, one-vote, democratic secular Palestine. We ask Tom Mulcair to support the demand of Palestinian unions, civil society and unions across Canada and around the world which call for Boycott, Divestment and Sanctions against the Zionist state until its apartheid practices end.